Businesses search for both web designers and web developers these days to elevate their online presence. While aspects of a web designer’s job may resemble that of a web developer, the boundary between the two is getting blurred. Almost every other individual is calling himself or herself either a designer or a developer. But who really is a web designer or a web developer? Are they interchangeable terms with similar roles? Many people use the terms interchangeably, but the difference is quite subtle. 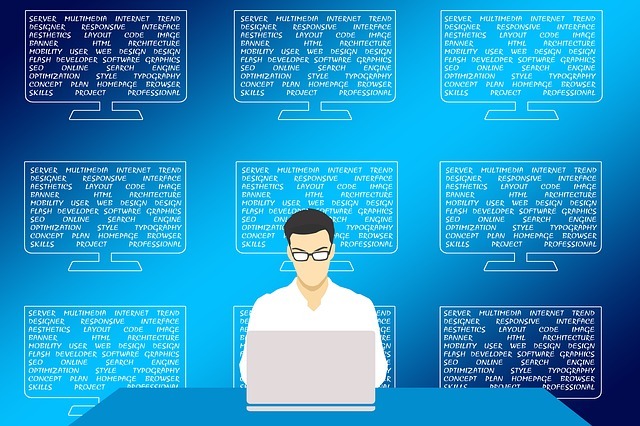 Though the topic can be quite debatable, we help break down the two terms to help you understand the two different aspects of the web building process and how the two fit in based on their roles. It’s important you understand the difference between the two to get some clarity. Who is a Web Designer? Web design is the very first step in understanding the fundamentals of how the web works that encompasses several different aspects and disciplines of the web building process, starting from graphic designing to programming and coding. The role of a web designer is to build layout for a visually appealing website, mostly everything that you see on a web page including texts, colors, graphics, layout, etc. Web designers play an important role in the success of the final product which is a fully-functional website with visually appealing elements. One of the main aspects of web design is information design or information architecture. To better understand the job of a web designer or a web developer, it’s important to understand the discipline first. Web design is the first step which encompasses several different aspects of the web building process including web layout, web graphics design, website structure, navigation ergonomics, website structure, color, texts, fonts, imagery, and more. Web development is rather a broad term refers to the steps involved in developing websites for the internet or an intranet. It is a well documented step-by-step instruction that need to be followed from start to finish to in order accomplishing a web building project. Web designers are usually creative types with a knack for realizing the bigger picture and understanding the clients’ vision. They get a better hold of this vision and transform this into an aesthetically carved design to please millions of potential viewers. Most web designers study typography and the graphical aspects of a website. Web developers, on the other hand, are more technical in nature who transforms those designs into live websites. They use web tools and languages to develop the design and functionality of a website. Developers usually write codes in multiple languages. Web designers are responsible for the design and layout of the website, usually the graphical aspects of a website. The main job of a web designer is to maintain a perfect balance between the aesthetic elements of a website and its usability. In simple terms, a web designer works to transform a simple idea into a visually appealing design. If a designer’s role is related to how the website looks on the outside, then a developer’s role is to work on the functionality of a website to see how it works. 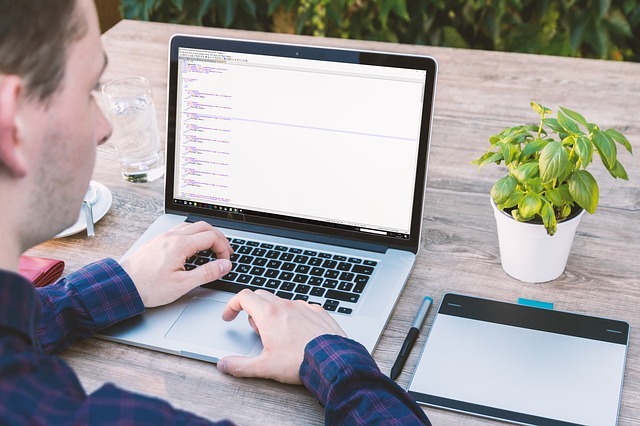 Web developers are usually responsible for designing, coding and modifying the different aspects of a website according to the client’s specifications. Web designers’ job is to understand the client’s requirements and develop an information hierarchy to help guide the design process, mostly related to graphics design and aesthetic portion of the website. They use many different basic design principles to build a visually appealing layout for a better user experience – from a balanced website design and color correction to clean navigation and usability. Web development is more about probability and utility which determine the success or failure of a website. Visual hierarchy is one of the fundamental principles of web design in web building project. Sagar Khillar. 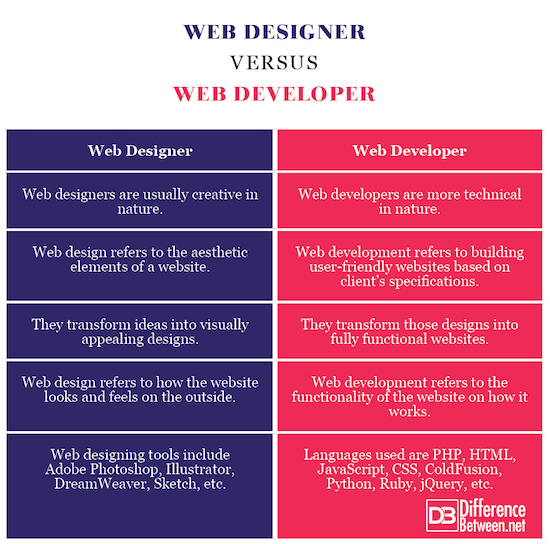 "Difference Between Web Designer and Web Developer." DifferenceBetween.net. June 4, 2018 < http://www.differencebetween.net/technology/software-technology/difference-between-web-designer-and-web-developer/ >.